The MINI Coup?Concept is an expression of MINI design and the great ability of the brand’s designers to fill the elementary values of the brand with new life, using the options of modern drivetrain and suspension technology, and developing fascinating perspectives for the future of the brand on this basis. 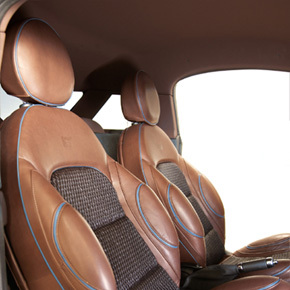 Presenting the concept of an uncompromisingly sporting two-seater to be seen for the first time at the Frankfurt Motor Show (17?7 September 2009), MINI is unveiling an unusually attractive vision of how the model family may well develop in future. The source of inspiration is once again the fundamental motive so characteristic of every MINI: driving pleasure. The MINI Coup?Concept therefore represents the ideal of a car destined in every respect to offer a thrilling experience and make every journey a truly unique thrill. 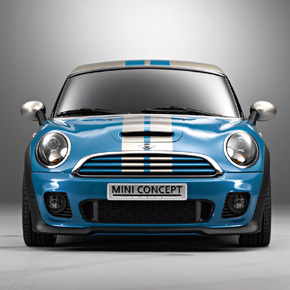 The MINI Coup?Concept brings together a wide range of features for a truly sporting and ambitious style of motoring. Limited to two seats and following a philosophy of consistent lightweight construction, the car clearly meets all the requirements made of a particularly active and dynamic coup? Compact dimensions, perfect axle load distribution and a low centre of gravity offer ideal conditions for enhancing the agility typical of MINI to a level never seen before. Through its design alone, the MINI Coup?Concept brings out all the thrill of individual mobility and the focus on pure driving pleasure. Powerful proportions and dynamic design language evoke a sense of desire and strong appeal, the MINI Coup?Concept offering a particularly undiluted expression of the brand through its sporting and unconventional stance on the road. 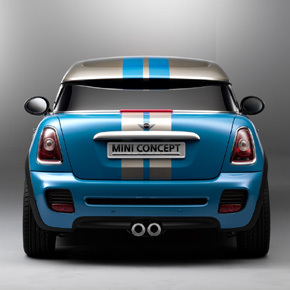 The MINI Coup?Concept: an invitation to enjoy spontaneous mobility. The current models in the range already meet the most varied demands. As individual characters in their own right, the MINI, MINI Clubman and MINI Convertible all offer a unique rendition of the driving experience so typical of the brand. And now the MINI Coup? Concept brings out driving pleasure in its most concentrated form, extreme lightweight technology making this two-seater particularly agile and unusually efficient. At the same time the low roofline, the precisely defined spoiler edge at the rear and other aerodynamic features enhance the car’s performance to an even higher standard. 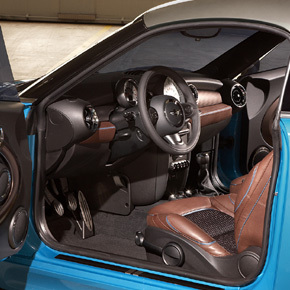 So that in its design and in the use of high-performance drivetrain technology, the MINI Coup?Concept offers ideal conditions as a compact sports car in the premium segment.